A federal judge today rejected a Boston man's argument that the Second Amendment lets him walk around with a gun if he feels like it and upheld his three-year jail sentence for unlawful possession of a firearm and possession of a firearm with an obliterated serial number. Read more. Transit Police report a train fatally hit a man on the Fairmount Line tracks at Uphams Corner around 3:45 p.m. on Wednesday. Read more. The Dorchester Reporter reports on the proposed shop on the site of the Kriola restaurant on Hancock Street. 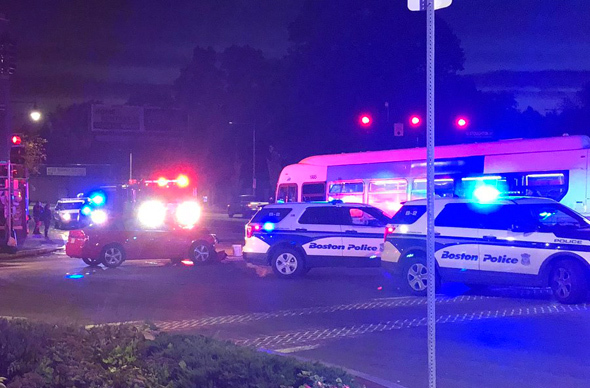 Boston Police report gang officers making a traffic stop on Humphreys Street last night arrested the driver and his passenger after finding a loaded gun with a laser sight in the car and "a knife with a curved blade" on one of them. Read more. The Globe reports workers had been complaining about bug bites for months. Two men have been charged with an Oct. 2 incident on Harlow Street in which one of them allegedly shot at a man sitting in a car and hit his car but missed him, the Suffolk County District Attorney's office reports. Read more. Around 3:15 p.m. on Harlow Street, off Howard. 21 Sandwich reports he came on this scene in front of the Payless shortly after 1 p.m. The driver appeared to have escaped with just minor injuries, he says. One of the 17 people charged in connection with a crackdown on two Dorchester gangs was actually arrested last November, pleaded guilty to federal drug charges in February and was sentenced in May to 30 months in federal prison and three years of supervised release, during which he agreed to stay out of Grove Hall and Uphams Corner. Read more. A Suffolk Superior Court jury today deadlocked on the murder charge against Onyx White, charged with first-degree murder for the death of Geraldo Serrano, 71, during a robbery at the Hermanos Unidos store, 728 Dudley St., according to the Suffolk County District Attorney's office, which announced plans to re-try White before a new jury. Read more. Around 10:25 p.m. at 5 Groom St., off Humphreys. Boston Police report the man, in his 20s, was pronounced dead at the scene. Columbia Billiard Co., 558 Columbia Rd., has trouble with a capital T and is currently shut as its new owner awaits word from the Boston Licensing Board both on a series of violations found in a February inspection and its requests for the licenses it should have had before that inspection. Read more.